We are offering all our Multifunction Power and Energy Meters to commercial patrons. 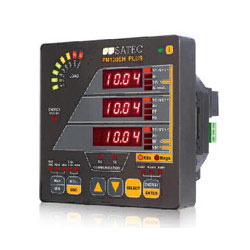 These power and energy meters are reliable in working and provided with multi displays to show readings. Incorporated in 2013, Saisha Electricals is one of the prominent traders and suppliers of High End Multifunction Energy Meter, Power Quality Analyzer, AC Drive, Energy Monitoring System, Remote Data Monitoring System, Prepaid and Postpaid Metering System, Battery Less Solar Generator, Panel Accessories, Electronic Potentiometer, Pump Controller, LED Lighting and Customized Load Bank. All measuring products are light in weight and easy to operate in different laboratories with fluctuating power supply. We are offering all electrical products in different technical features. For the ease of the consumers our vendors make all products by following all rules of electrical engineering. Best configuration of these measuring electrical products meets to the global parameters. These measuring units are available in market in perfect packing.